Provide comfort for the family of Gregory Sandefer with a meaningful gesture of sympathy. 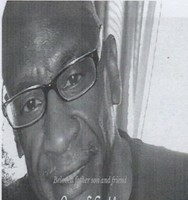 Gregory Sanderfer age 64, passed away in his home in Randolph surrounded by his family on Monday, April 6, 2019.He was born on October 27, 1954 in Macon Georgia to Valerie C. Williams and the ENTIRE Collins family. He and his siblings Milton Collins (deceased), Carol Sanderfer (deceased), Freddy Sanderfer, Anthony Sanderfer and Robert Williams were moved to Boston in 1963. He spent his childhood running around Dorchester and Roxbury playing sports anywhere he could. Basketball was his specialty which he made sure everyone knew. After graduating from Boston Trade High School in 1973 he worked hard to find a career that would let him pursue his passion in life; taking road trips back to Macon, Georgia with stops in New York and Virginia as often as possible. He married his childhood sweetheart Renee Sanderfer and had two daughters, Choconia and Veronique Sanderfer. He also raised his two older children Vlaleria Williams and Kevin Sanderfer. He worked at the Boston Globe for over 30 years with plans to move back to Macon after he retired.Being the amazing supportive man that he was, he put those plans on hold to be the primary caretaker of his youngest child and his mother when they had unexpected health problems. He spent the last seven years of his life with his partner Louise Quarles sharing with her their love of sports and family from Boston to Georgia. Known as Big G,Unk, G Money and many other nicknames, he spent his weekends trash talking about teams and taking side bets with his friends and family on who ever was playing.His love of sports which he inherited from his mother was only surpassed by his love of knowledge and learning.His role as the patriarch of our beautiful lineage will live on through generations. His support, advice and generosity and love will live in our hearts forever. To send flowers in memory of Gregory L Sandefer, please visit our Heartfelt Sympathies Store.